Vocal recording and effects chains include, depending on the performance, a de-esser, a noise gate, an equalizer, and a compressor. Frequently, engineers also add effects like chorus, delay, tape saturation (unless recording to tape, of course,) and reverb, to enhance the sound. In a pro studio, most of this treatment is handled by expensive hardware and plugins (like those from Waves and UAD.) But you don’t have to break the bank to polish up your vocal tracks thanks to the many libraries of free plugins found on the Internet, most available for any DAW that supports the VST standard. I’ve compiled a list of the best plugins for a killer free vocal chain, along with a sample of the plugins at work on one of my vocal tracks. A de-esser modifies the effect of the singer’s tongue and teeth. A noise gate is analogous to the singer’s lips, opening and closing. Equalizers and compressors, in some ways, address the result of microphone selection and placement. Finally, reverb and delay simulate the space in which the vocal is heard, analogous to the listener’s ears at the end of the chain. These are just guidelines, of course. You can combine effects in any order to achieve a specific sound. (For example, put reverb before the compressor for a pumping reverb effect.) However, this “vocal path” approach is a good starting point for most vocal effects chains, especially if your goal is simply a polished track. It’s dull: I chose the SM58 for this song because I like the way it saturates my “loud” voice. But that pleasant dynamic saturation comes at a price: Reduced clarity in the high frequencies. The dynamics are uneven: Notice how much the second “still” jumps out. Ideally, I should have re-recorded for a more even performance. But I liked the energy in this take, and since I knew I’d be compressing the track anyway, I decided to keep it. There’s sibilance: I could have eased up on those S’s a little. It’s dry: This is by design, as I wanted to keep my room sound out of the recording. However, a track this dry often sounds unnatural or harsh when mixed with other instruments, especially when those instruments (like the drum kit in On My Feet Again) have an open, ambient sound. Of course, this chain isn’t suitable for treating all vocal tracks. But each effect here is appropriate, given the issues identified above. 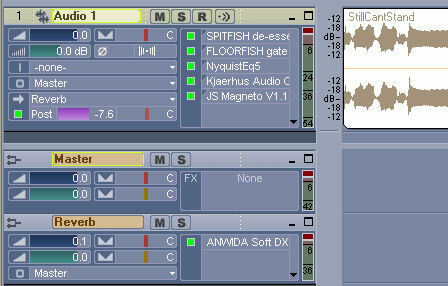 The de-esser (Spitfish) is tuned to roughly 7Khz, at a medium depth, just enough to soften the worst of the sibilants. In the quieter parts of this song, the noise gate action is pronounced, gating out my breathing. But in this sample, it doesn’t have much work to do. My inhalation sounds add urgency here, and I didn’t want to cut them out completely. To address the uneven dynamics, I started with the Classic Compressor’s vocal preset, set the threshold appropriately, and boosted the ratio just past 5:1. That’s fairly aggressive compression for a vocal track, but I think the “squashed” sound really suits the song. Finally, the reverb. I placed this plugin on a bus (or “effect send” in some DAWs,) instead of directly on the vocal track, mostly out of habit. I find it more convenient to adjust the reverb level without having to open the plugin interface. Also, while it’s not relevant in this case, I often use the same reverb effect on several tracks (for example, vocals and acoustic guitar) to place the tracks in the same “space,” and using a bus lets me do this with only a single instance of the plugin. The plugins I used to build the free vocal chain are my personal favorites, but we all work differently so they might not suit your style. (The Nyquist EQ, in particular, is less-than-intuitive if you’re used to traditional parametric equalizers.) Fortunately, there are hundreds of free plugins offered on the Internet. If you’d like to tweak this chain for your own uses, check out Audio Mastermind’s list of free VST plugins. I like your rationale for how you build up the chain, but I’ve thought of an alternative argument: the de-esser and noise gate are removing unused information, the EQ is modifying what’s left, and the reverb and delay are then adding something on top. This makes a lot of sense too – start by removing the things you definitely don’t want, and wait until the last opportunity to add on additional sounds. Hey, that’s a good approach, Pete. It’s a little more flexible than what I described too, since it requires you to think in terms of the sound, rather than the process. And of course the sound is the only thing that really matters! Hi.. Great list, thanks. :) Nice to have more quality toys to play with. Again, a wonderful blog you have here! Thanx for the lust…I can’t wait to try it out! & here i stumble in a very interesting site. also petes logical approach to it gave me a hint. I agree with Daniel R., your voice rocks! Would effects should i use for Screaming parts? and are there some free plugins for screaming around? and does somebody know where to find a vocoder, or something to make this spacy-like voice, typically for bands like Mogwai…..
Man, I really love your blog. I have only read two entries but it has been vastly more informative than anything else I’ve tried. (reading manuals, talking to experts, experience, etc.) Thanks. Keep up the good work. I use Camel Crusher on my screams. Its a distortion unit with a very nice compressor built in. Its remarkable for warming up vocals or flat out dirty-ing them up. OMG, your voice is AWESOME! Jut thought I would tell ya, from one vocalist to another. Great tone and skilled control! Nice!!! I like good freeware. Actually, if Linux had a driver for my E-MU 0404 and as much recording support as Windows and Mac has, I’d be recording with it instead.